I see that in its infinite wisdom, Photobucket has decided to remove all the links to the photos in this thread so I'll try to replace them over time from a different source. Finally worked out how to transfer from Flickr (first photo done!) so lets go with that. Well here we are 2 years down the line and it's still not finished! We are at least another step closer on this marathon-esque build. I gave the whole thing a gloss coat with Tamiya X22 and then polished it with a fine sander until it squeaked. Then it was time for some excessive squinting. 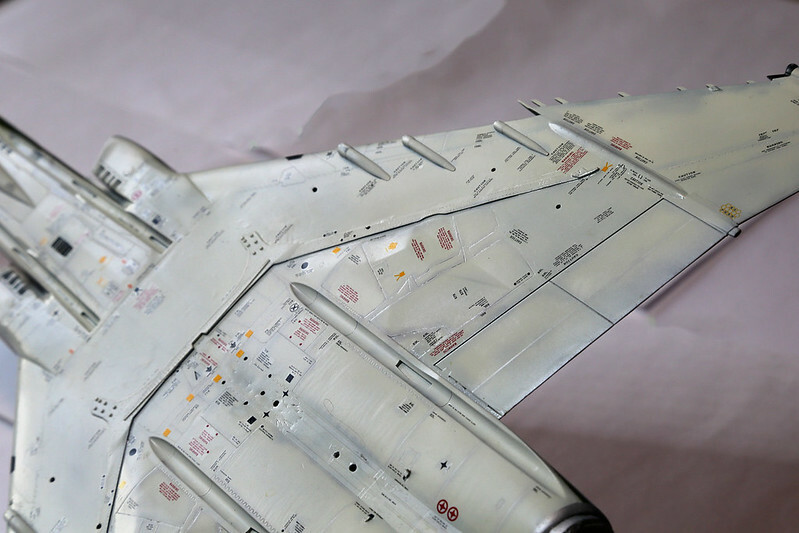 I do like decaling as the model takes on its identity and it usually adds some colour and detail that starts to bring the project to life (clearly I am not a fan of dull grey on grey markings). 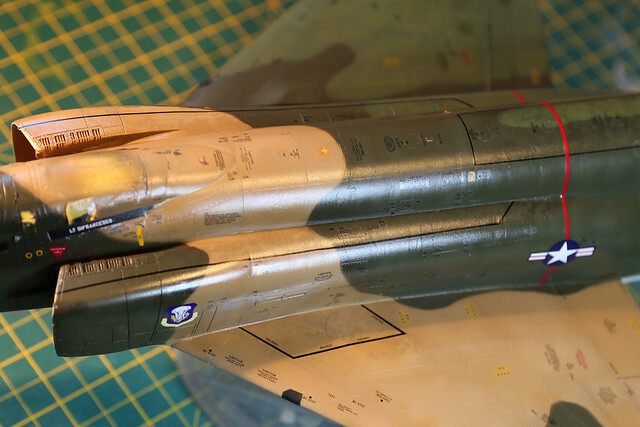 However, a model on this scale can take a lot of decals before it gets swamped and the F-4 was no slouch in the tattoo arena. 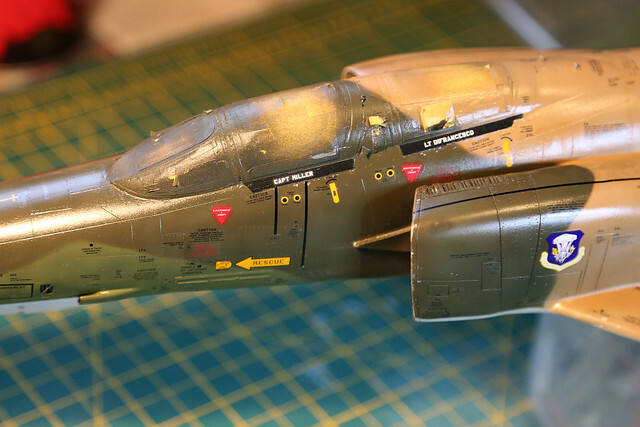 I borrowed the walkway lines from an RF-4C decal set and some spare black lines. The stars and bars are from Microscale. No real issues with any of them. Icarus do a nice line in black stencil data suitable for a jet of this period. You know you are in for a long ride when they recommend blowing up the instructions to A3 so you can keep track of them. Even so, some of the placing and orientation was a nightmare in guesswork. 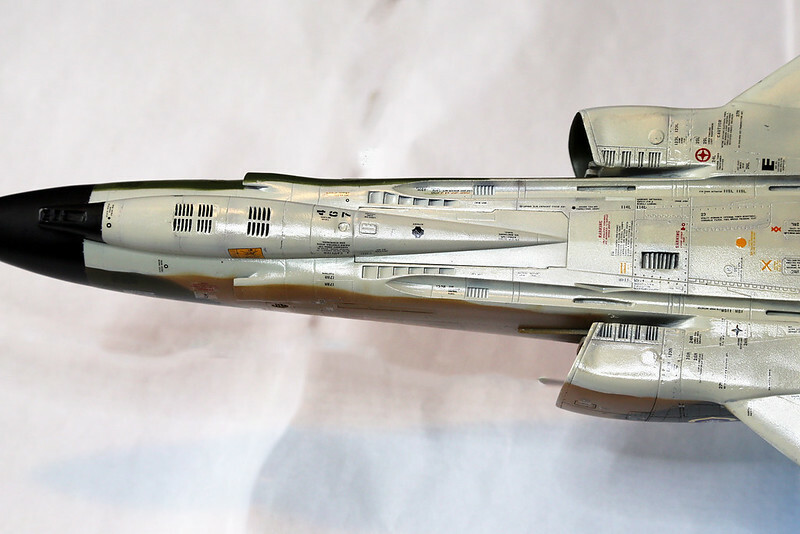 The 'F-4 under the skin' references were invaluable in helping out, even if they were for Greek RF-4Es. Anyway, the top surfaces are done and sealed with another gloss coat. I have to say I did slightly better than normal in terms of silvering and with a bit of blending in at the weathering stage even the worst offenders should be hidden from view. Of course I still have the underside, fuel tanks, weapons and pylons to do - a month off work should crack it! See this, kids? This is why you don't build jets! That's like Shakespeare's collected works in stencils! Good job on the lot! An old USAFE Hahn-bird... VERY NICE !!! Never-the-less: looking quite nice and looking forward seeing this bird finished. That's one impressive feat of stencilling! Thanks chaps, and I still have half the stencil decals to go! There's not a lot of detailed info on these older F-4's so any steers are welcome. PS - I didn't mention that the unit markings are from Air Doc and go on very well. Happy New Year everyone! Wishing you all a very constructive 2018. Well I've managed to use some of the Xmas break to continue the somewhat painstaking art of stenciling. 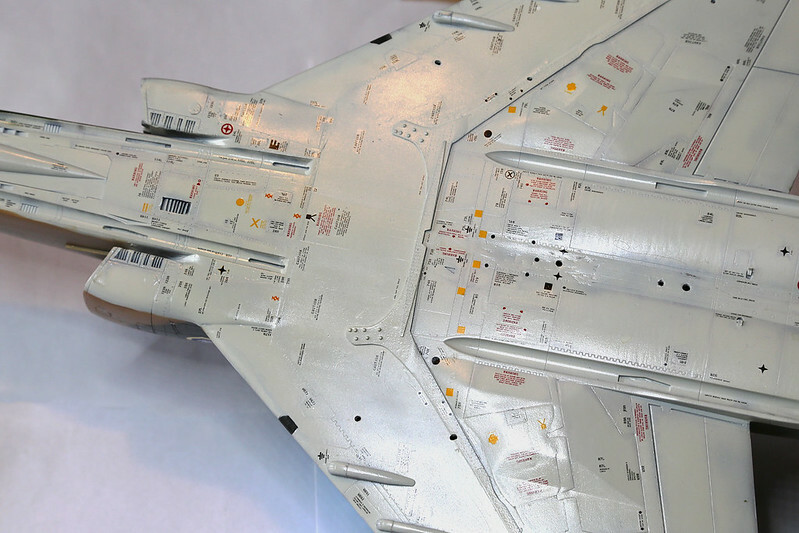 Pictures of the underside of F-4s are somewhat difficult to find so some of the placing is a little subjective and some of the decals you won't even see when the weapons are on but I figured that if you buy them you might as well use them! As you can see there's no shortage of useful information for the ground crew though how they can read any of it under the jet beats me. The nose gear door is not glued as its where I access the batteries for the lighting. Next step is to finish off some of the weapon decaling and then on to my favourite bit, a bit of weathering! Actually my favourite bit is unmasking everything at the end but that's a little way off yet so weathering it is. I think I would have lost my mind just looking at the stencil sheet. That is a crazy amount of work you put in there! The guys from maintenance crew were clearly NOT expected to bring ANY prior knowledge to their work with these birds. The whole User-Manual was just printed on the machine! 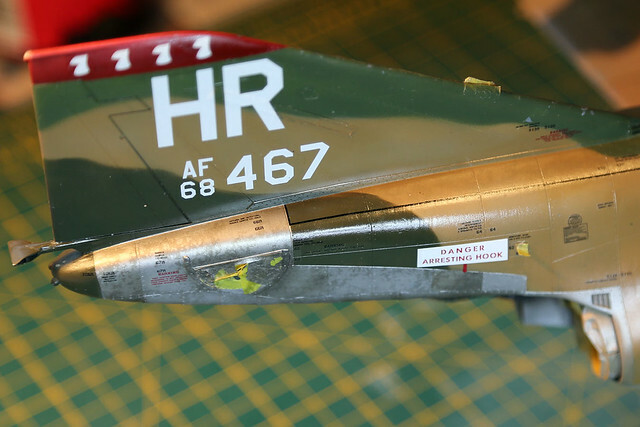 I bet you read all this stuff, while applying the decals, Richie, and now you could immediately start to work on Phantoms. That! is a lot of alignment. Well done. Oh my goodness... that is an insane amount of stenciling! That looks beautiful! But OMG the stencils! I spent a short time with VMFP-3 in 1984-5. 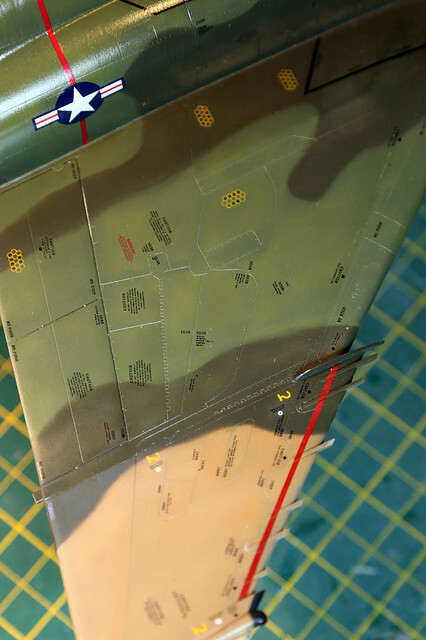 The Rf4-E's were that grey on grey radar reflective paint. Not pretty at all. Just think of the poor guys and gals who had to paint these on for a living! Many thanks for the feedback chaps, I think it took twice as long as it should have done as I ended up reading most of the markings to see what they referred to. It might be a little while before I tackle a similar task.